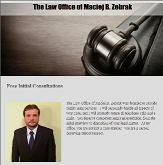 The Law Office of Maciej B. Zebrak provides quality legal services in Mechanicsville, Virginia. Family Law matters are the primary focus of my law firm with an emphasis on Divorce and Child Custody and Visitation. I can also represent you in matters involving Wills and Criminal Defense, including Traffic, Misdemeanor and DUI cases. I built my practice on the belief that you deserve a law firm that will provide you with professional representation from start to finish. In our initial interview, you are immediately put at ease. I start by getting to know you and the details of your situation at no cost to you. When you become my client, you are not handed off to a staff member. I will personally answer all of your questions, promptly return all of your calls and address every aspect of your case. Professional representation is about more than building on my own success. It also involves helping my community. I provide pro bono services to the Central Virginia Legal Aid Society and the Legal Aid Justice Center. I am also a member of the Virginia State Bar, Virginia Trial Lawyers Association and the Virginia Association of Criminal Defense Lawyers. If you want quality representation with a personal focus, I am the Family Law attorney who can help.